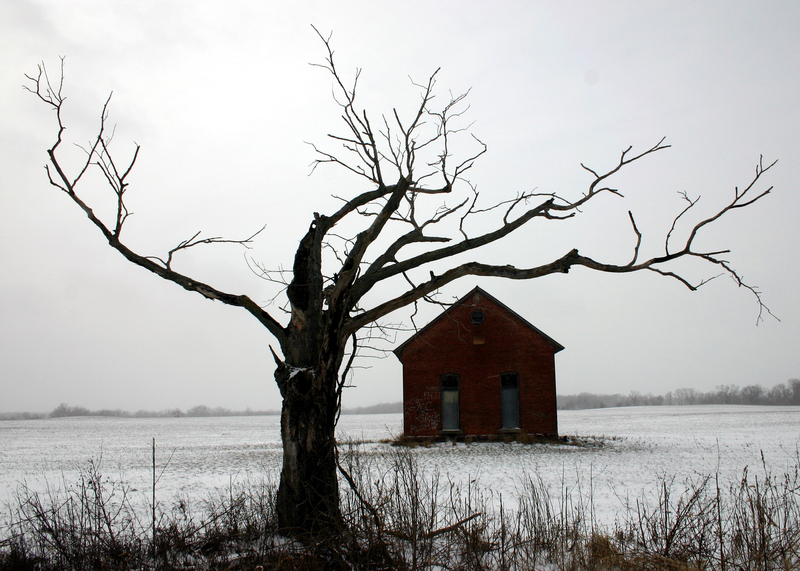 This week I finally made it to the nearby farm that sells home-grown produce. I’d been there before, but it must have been a year or so ago. It’s only a 30 minute cycle ride away from our house, so I can’t really say why I don’t go more often. I do love going there as it’s such a rustic place with a dog greeting you as you arrive, and a ginger cat curled up on the drive. And they have a good selection of foods on display in their barn. Since it’s apple and pear season, they had several crates full of the fruits, and they even had a choice of varieties of apples. I came away with: pears, red plums, strawberries, beetroot, cream cheese and a bottle of apple/pear juice. I had already a use in mind for the plums: the Each Peach Pear Plum Flan from Kirsten at Peace, Love and Muesli. When I saw the recipe on her blog, I knew I wanted to make it with the first bag of pears I got my hands on. So this week I made it (with just the plums). 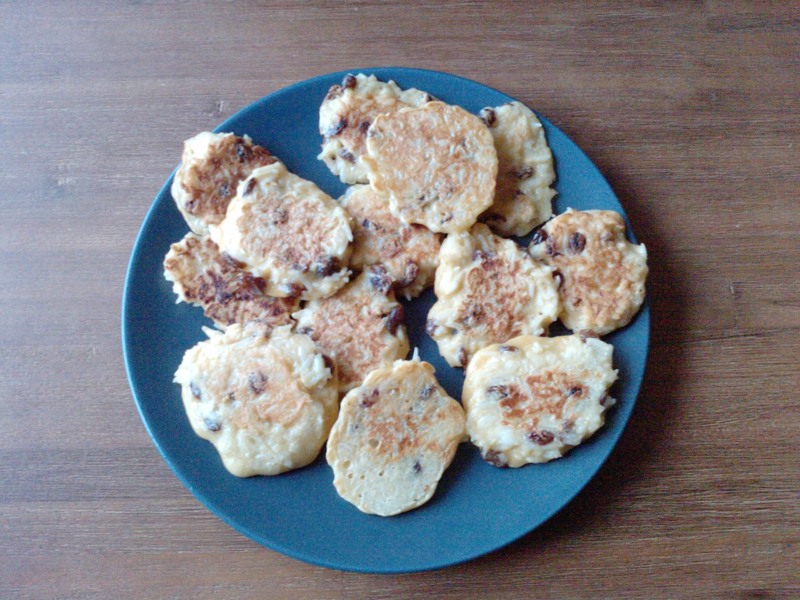 Now, the black on top isn’t really black, it’s caramelized brown caster sugar. A bit less of it would have done just fine, but as it was, the flan was really, really good. And the only ingredient I don’t normally have in the larder were the plums. Sometimes, I buy a food (like the plums in this case), then at home I look up a recipe and find that I need to buy several other food items before I can make it. Not this time. Very easy and very tasty. Here’s the recipe. Flans and diets obviously don’t really go together, although they can do. As I decided a few pounds fewer would look really nice on my figure I looked for a diet that I could keep to without too much trouble. So I found this diet that isn’t really a diet, but a way of keeping track of the calories you consume and the exercise you take. 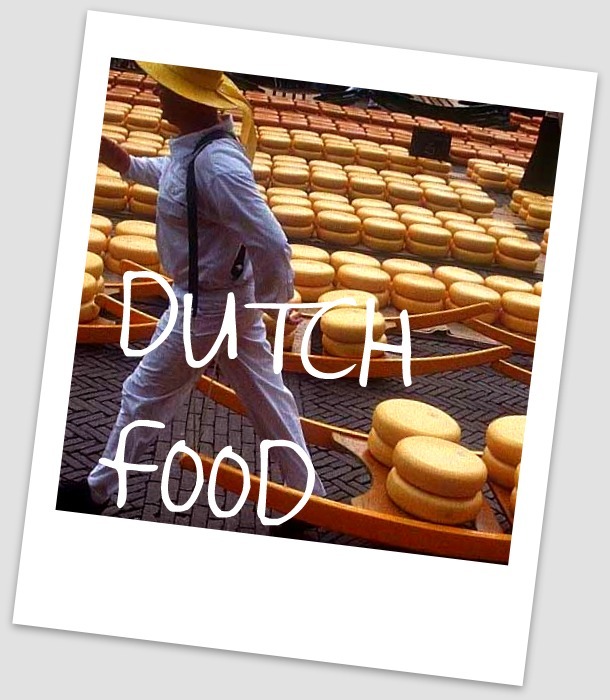 It knows lots of foods and their calorific value already (users can enter new items themselves) and I was happily surprised to see that the Dutch dessert I had eaten as well as the British cereal were already in the system (the exact brands that I used). It had loads of American foodstuffs as well (I think it’s originally American). It works like this: at the very start of your new diet plan, you do tell it how much weight you want to lose and it suggests a maximum number of calories per day. In my case, it’s 1550, so that allows for some decent meals. You fill out for each meal what you ate and this is taken off your allowance for that day. The only thing you have to worry about is that you don’t consume more than your allowance. And when you do some exercise, the calories you burn are added to your daily allowance! I love that kind of diet because it allows you to eat whatever you like, as long as you don’t overdo it. Those diets where you can’t eat chocolate? I can do them until my chocolate craving gets out of hand and I eat a month’s worth of chocolates. With this new diet, I can go on a long cycle ride and then have my cake and ate it. Or my chocolate, or indeed a plum flan. The programme is called My Fitness Pal, it’s online (there’s also a mobile version) and it’s free. I’m Leeswammes, if you would like to join and link up with me. Please do! I need some support. 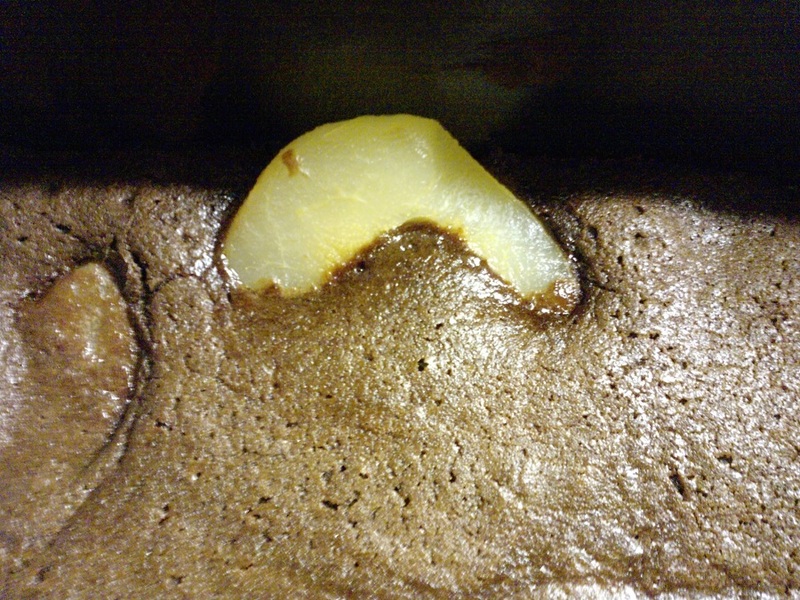 Last week, I wanted to make a nice and quick desert for my family, and decided to make a Chocolate Pear Pudding from Nigella Lawson’s website. Each month, she has a “Cookalong” where one recipe is featured which readers can make and comment on. The chocolate pear pudding sounded easy and yummy. It’s a recipe that you can probably make any time, as it needs only some basic cupboard ingredients. You can read the full recipe on Nigella’s website, but it’s very simple: put some canned pears at the bottom of an oven dish, and cover this with a mixture of flour, cocoa powder, sugar and eggs. Of course, some baking powder too and some bicarbonade of soda, which I was very proud to have. You see, I haven’t been able to find baking soda in Netherland but in England it’s easy to get hold of. So when I was there over Christmas, it was on my shopping list! Anyway, you just mix it all (with some vanilla extract) until it becomes smooth. Our dough wasn’t runny enough (or our baking dish was too big) so we weren’t able to cover all the pears, but this didn’t matter. The dough spread out during cooking to fill most of the dish. What else can I say? It was delicious. Nigella speaks of the need of chocolate sauce but we found it rich enough. 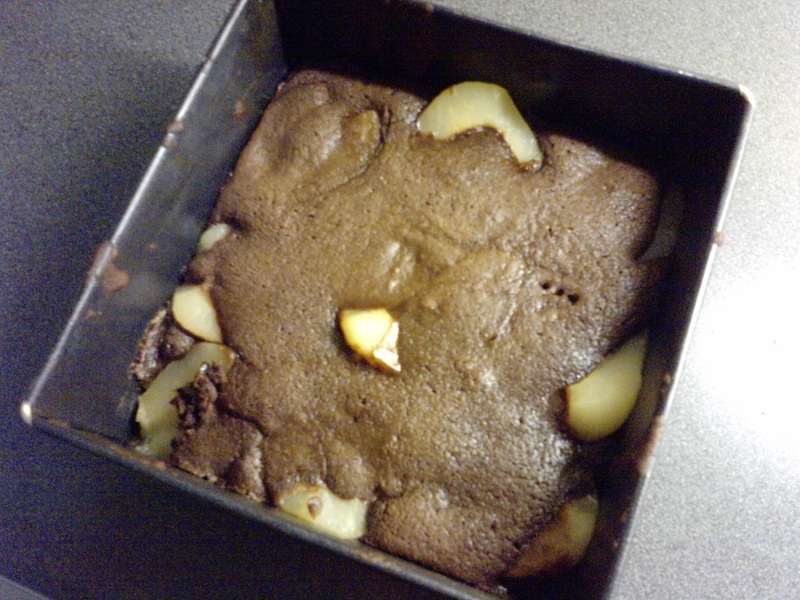 It reminded me a lot of brownies (on top of pears, that is! ), but the brownies I make don’t contain any flour. We ate it still warm, with ice cream (just plain vanilla) and it was lovely. Yesterday I accidentally put a whole pack of rice in a pan, although I didn’t need that much for our evening meal. 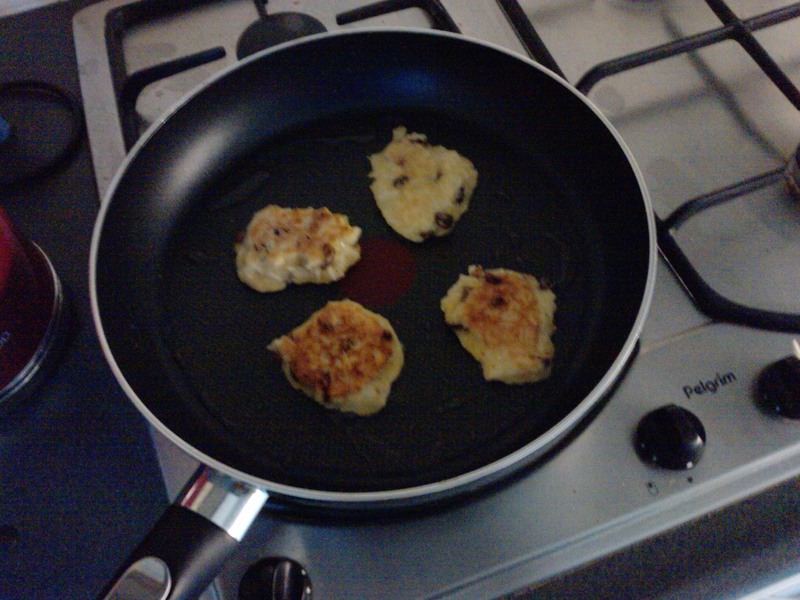 So, I decided to cook it anyway, and keep some for today and make some rice cookies. Let the raisins soak for about 2-3 minutes in hot water and pat them dry with a clean tea towel. 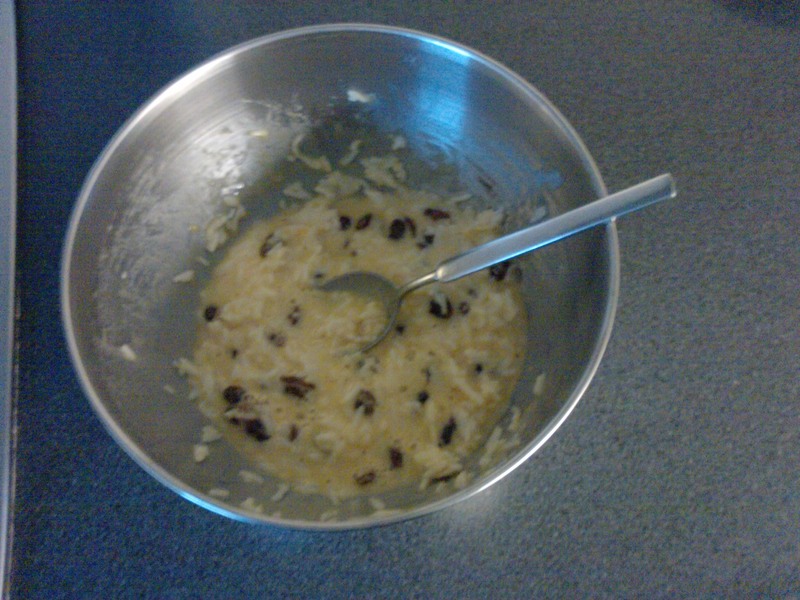 Mix the rice with the milk, eggs, raisins, flour, sugar and cinnamon powder. Heat a tablespoon full of oil in a frying pan and spoon three heaps of the rice mix into the pan. Bake the cookies for about 5-7 minutes until they are golden brown, turning them over once. My pan is rather large and I was able to bake them in fours. 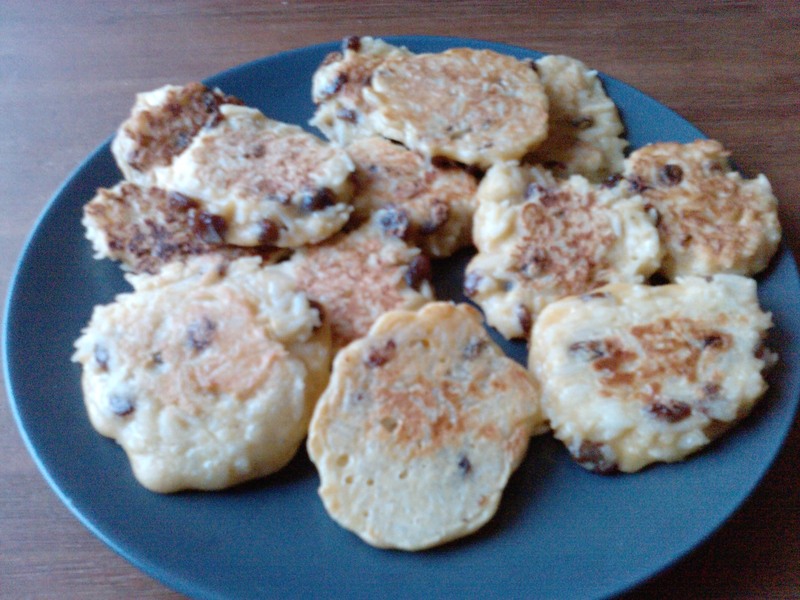 Eat as they are or drip some syrup on them or add some powdered sugar before eating. This is also my entry for the Whip Up Something New Challenge in which we are asked to try a recipe that we have not made before. 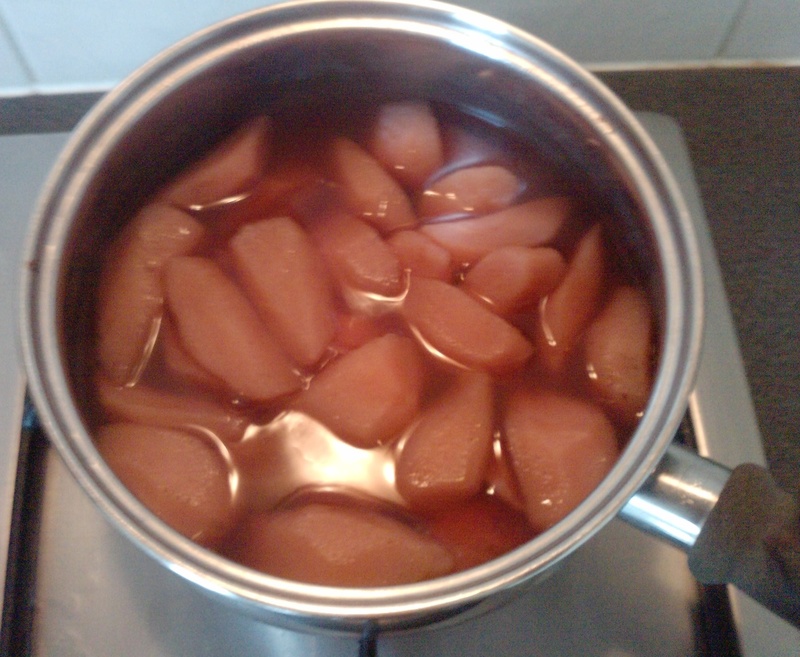 Stewed pears are something many Dutch people like to eat with their main meal as a side dish or for desert. 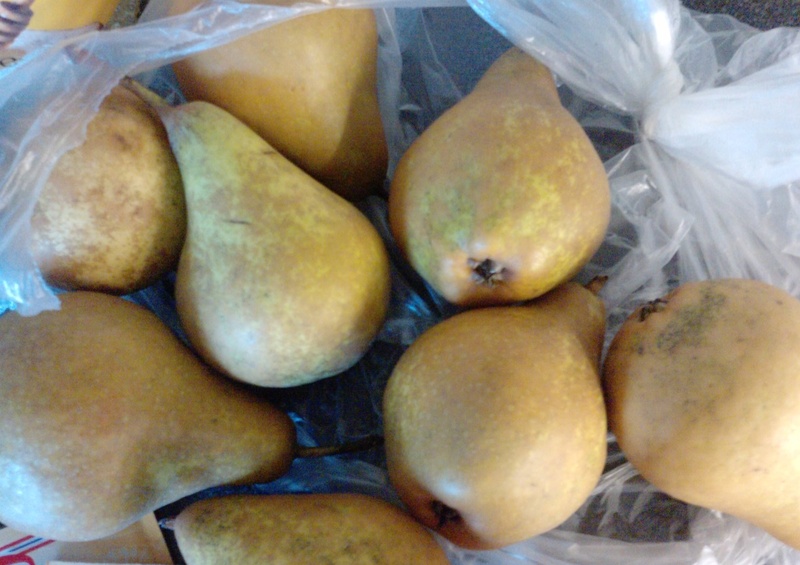 We never stew apples (at least not as a nation) but stewed pears are popular, and you can also buy them ready-made in the supermarket – in the fruit section, in a plastic container with some of the juice. 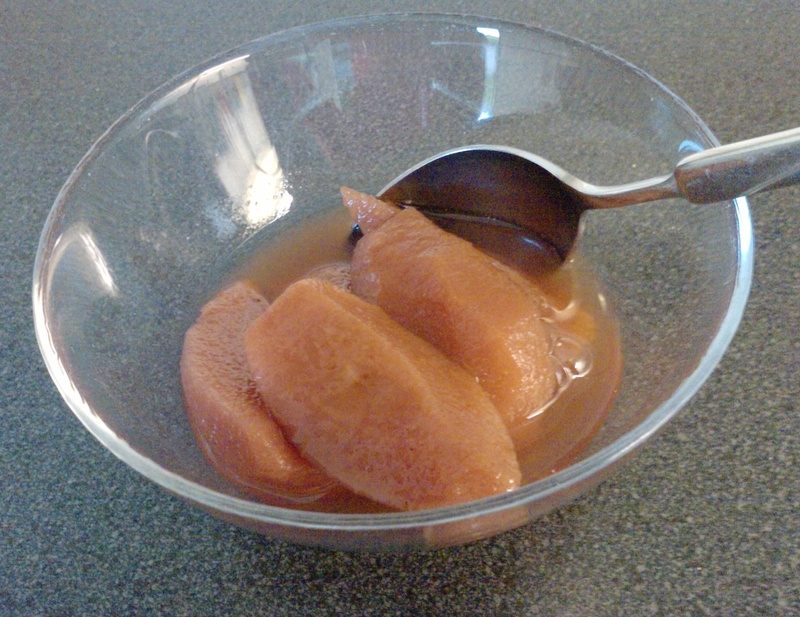 Stewed pears are sweet and soft and especially nice with spicy food. We make sure they’re cooled down before we eat it; we might even refrigerate them for a while, if there’s time! 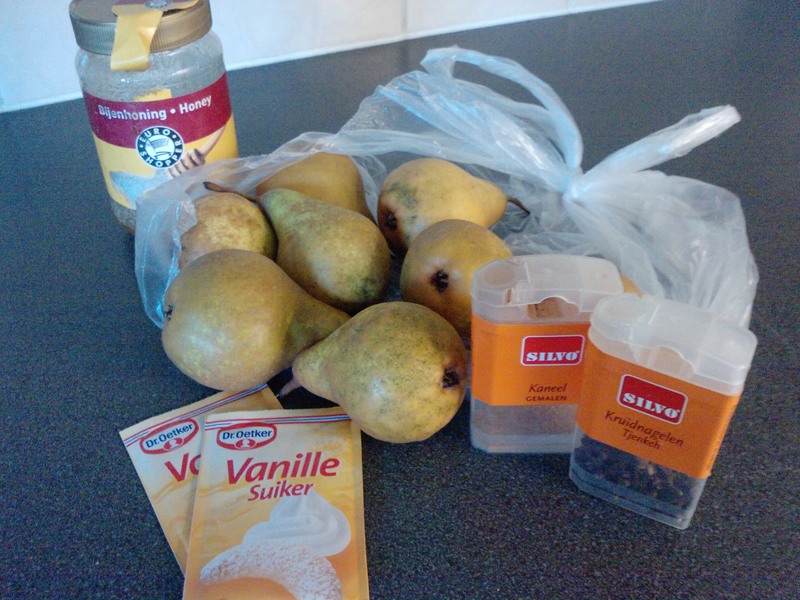 The pears we use are pears that are especially sold to make stewed pears: Giesser Wildeman pears. They are quite small, hard, and ugly looking. When cooked, they become soft and delicious. 1. Peel the pears. You can either cut them in fours, take out the core OR leave them whole. 2. Put in a pan. If the pears are whole, stand them up in a pan that is just big enough (that way, you need less water, and the liquid will become more syrup-y). 3. Add water so the pears are just covered. 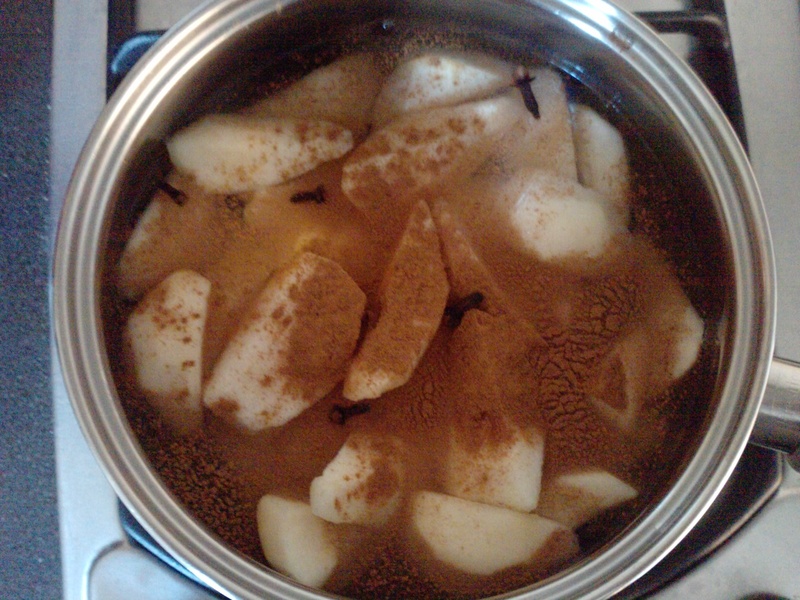 Add cinnamon and cloves. Bring to the boil. 4. Add sugar and honey. 5. Put on a low heat for at least 1.5 to 2 hours, until the liquid becomes syrup-y. (I never manage to get a syrup, but maybe you will!) Stir every now and then. 6. 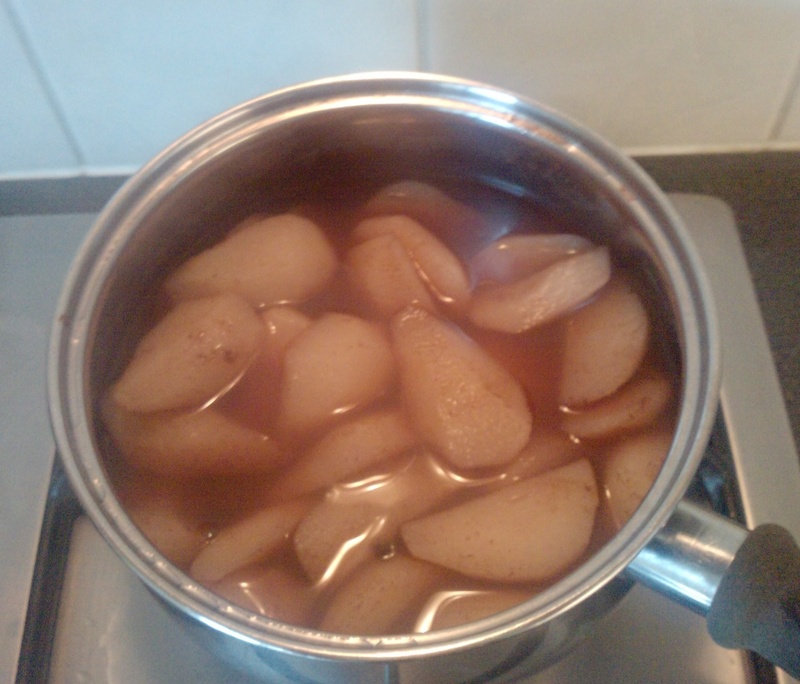 Take the cloves and cinnamon stick out of the pan and let the pears cool down. Keep them in the refrigerator until use, and don’t forget to use the delicious syrup, too!